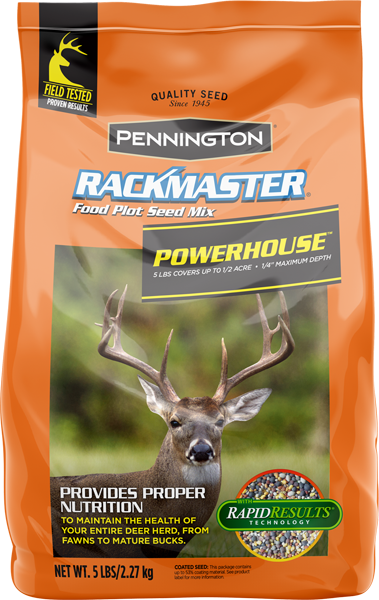 Rackmaster Powerhouse Food Plot Seed Mix - 5 lbs. RACKMASTER Powerhouse is a blend of high yielding perennial forage chicory and Pennington’s widely used Durana perennial white clover – both of which can persist multiple years when properly managed. It is a high quality and protein packed forage mixture highly preferred by deer, turkey and other wildlife. With good management, this powerhouse combination can produce 2 to 3 tons or more of dry matter forage per acre annually, supplying abundant amounts of highly digestible, premium quality forage for deer and other wildlife throughout the spring and summer months and into fall. With protein levels of 25% and digestibility of 75% or more, Powerhouse helps maximize body and antler growth of bucks and optimize milk production for nursing does. It features Pennington’s ultra-popular Durana white clover which is drought tolerant and annually captures up to 150 lbs. /acre nitrogen reducing the need for commercial nitrogen purchases while building organic matter and improving soil tilth. Chicory is also drought tolerant and uptakes an array of minerals from the soil into its leaves that are needed for good antler growth and deer herd health. Powerhouse can be planted alone or used in mixtures with other winter annual small grains. 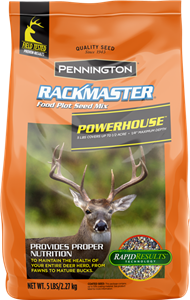 RACKMASTER Powerhouse features RapidResults seed germination enhancement technology which promotes quicker emergence and stronger, deeper root growth. The result is a hardier and more productive food plot. To attract and provide nutrition for deer throughout the year. To furnish high quality nutrition for growing bucks and fawns, pregnant does, and does nursing fawns from spring throughout summer and into the fall. In a mixture with winter annual grasses to boost deer attraction and increase nutritional content of the food plot.